Gameweek 22 was marred by a couple injuries to major players, as both Harry Kane and Trent Alexander-Arnold went down for what is expected to be a month. That's in addition to Son Heung-Min joining South Korea for the Asian Cup. This also comes on the heels of Sergio Aguero dealing with a week-long illness that saw him come off the bench against Wolves. The other problem is that Gabriel Jesus scored a brace and will continue to steal time from Aguero. 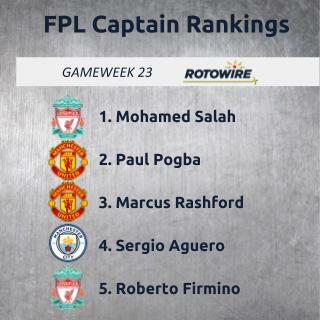 The good news for Gameweek 23 is that there are multiple places to turn for captaincy. Liverpool (v. Crystal Palace) and Manchester United (v. Brighton) lead the way at home, but Manchester City (at Huddersfield) and Tottenham (at Fulham) are also in excellent position to score multiple goals. Man United, fresh off a win at Spurs, will be considered by most with back-to-back home matches against Brighton and Burnley. Paul Pogba hasn't scored in the last two, but it's hard to argue his six shots on goal and five chances created. Marcus Rashford is on the same level with a goal in each of his last three starts from eight shots on target. I still prefer Pogba between the two because in addition to getting shots on goal, he's creating much more for his teammates. Liverpool are in the same mold against a Crystal Palace team who have given up multiple goals in three of their last four away matches and just gave up two at home to Watford. Mohamed Salah can't be stopped with eight goals and three assists in his last eight starts in league and UCL play. He's not getting as many opportunities as Pogba, but if Liverpool score (and they will), he's going to be involved. And while Roberto Firmino is inconsistent, this is the type of matchup he could thrive in and may be worth a gamble if you want to make up some ground. Clean sheets are possible, but it'll be hard to captain the likes of Luke Shaw or Andrew Robertson above someone who is likely to score. As for Man City, it's again a matter of picking the correct player. Jesus was the main benefactor against Wolves, while Raheem Sterling failed to make the score sheet for the fifth time in his last six starts in league play. Leroy Sane has been a bit more consistent, but it's still hard giving the armband to anyone other than the lead forward for City. Even then, it's not guaranteed Aguero will return to the starting XI against Huddersfield, though it appears likely. City are on the road, but Huddersfield have given up multiple goals in three of their last four at home and a new manager shouldn't change much. The differential move may be to go Tottenham, even without Kane and Son in the lineup. Fulham have allowed more goals than anyone in the league and lost 2-1 against Oldham in their last home match, and that included most of the regulars on the back line. When Kane was injured last March, Spurs had no trouble scoring, tallying 10 goals in three away matches (two league, one FA Cup). Son was still around, but Dele Alli and Christian Eriksen both bagged three goals each. Without Son, Fernando Llorente could start up front, but Alli and Eriksen are easier to trust for the armband. Alli is more likely to score while Eriksen is more likely to assist from set pieces. You could also throw Kieran Trippier into the mix if you think Fulham will be held scoreless again. I'm avoiding Arsenal and Chelsea for different reasons. The Gunners are struggling and just failed to score at West Ham, while Eden Hazard has fallen off and will be even harder to trust in this matchup. Troy Deeney may be the more enticing play with three goals on 11 shots and one assist on six chances created in his last four starts. While Burnley have found success in the last couple weeks, a lot of that has to do with their schedule, and they're still allowing two goals per away match. There isn't another matchup that stands out, and that's seen in the odds. Newcastle (v. Cardiff) are the biggest favorite of the smaller teams, yet no one wants to captain Matt Ritchie or Salomon Rondon. The same goes for Wolverhampton (v. Leicester), Bournemouth (v. West Ham) and Southampton (v. Everton), as all are in tricky and unpredictable spots.